It seems to be a birther media frenzy of late, fueled by the latest Donald “zombie birther” Trump remarks. Now everything “birther” is all the rage — from Sheriff Joe Arpaio to Michigan candidate for the U. S. Senate Pete Hoekstra. an FBI person, maybe a CIA person and one person managing those two people, and just if you want to run for president, you’ve got to go with the right, proper documentation and go to that person and get it certified that you meet the qualifications to be president of the United States. Nothing to do with President Obama, Hoekstra told CNN. Putting that obvious lie aside, is this a good idea? Certainly we don’t want 50 states individually coming up with possibly conflicting determinations of eligibility. However, what if the Federal office were headed by Joe Arpaio (or someone equally nutty from the left)? I personally think the crucible of a national presidential election is more than sufficient to vet a candidate, and if there are any lingering doubts after the election, Congress has the power to step in. Nothing would satisfy the birthers, so why bother? The real problem the birthers have is that Barack Obama got elected. If the birthers don’t like that, the only way they are going to have anything different is to defeat him in the next election fair and square. Purpura v. Obama Appeal hearing video 5/31/12: Updated with results and new video! My notes follow the video below. 1. The judges seemed to notice that Apuzzo is trying to use a primary election statute to gain standing to challenge the general election. 2. Apuzzo clearly misstates the law of the United States regarding the citizenship of immigrant children prior to US v. Wong. 3. It was obvious that the judges were aware of the confusion resulting from 50 states making possibly conflicting decisions on a candidate. Apuzzo countered that it was simple and quick, one zip to the Supreme Court and everybody is satisfied, but having to admit that the present birther litigation is anything but simple and quick. 4. Apuzzo argues that “The Law of Nations” was adopted as the common law of the United States. Vattel codified a “universal principle of mankind”. He says that when the nation was founded “there was no other law,” a facially false statement which the judges couldn’t help but notice. 5. Apuzzo concedes that under English common law, parentage is not a requirement. 6. He concedes that the Electors and the Congress ultimately vet the candidates The judge notes that they already did this in the 2008 election. Apuzzo says that he doesn’t know what issues Congress looked at. The clause in the Constitution about presidential qualifications is like one sentence long. How could they have overlooked it? 8. Apuzzo admits that the Constitution makes provision for an unqualified president-elect, but then says that’s inconceivable. Well, whoever wrote that amendment conceived of it. And here is the decision of the court, lower court decision affirmed. Apuzzo lost. I said it first: Romney needs the birthers to become President. Stephen Colbert’s staff perhaps reads my blog because last night he did a deliciously funny piece on just that topic. 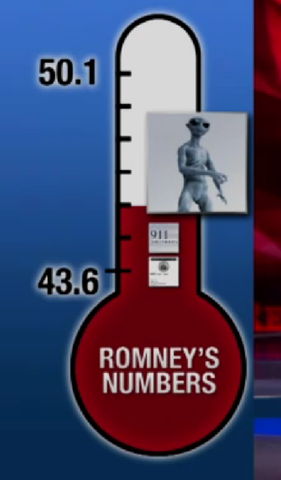 Highlighting the connection between birther Donald Trump and and Mitt Romney through a major fundraising event last night in Las Vegas, Colbert did the math showing that Romney needs birthers to win (and 9/11 truthers, alien abductees and a few more) 50.1%. Watch the video. The Romney/Trump section starts at 6:10. Today we remember the Purpura v. Obama ballot objection, born April 5, 2012, in New Jersey and declared terminally ill by Administrative Law Judge Jeff Masin a mere 5 days later. The suit was ill-conceived and born with fatal defects that could not be corrected. The Purpura lawsuit family representative Mario Apuzzo has sought a second opinion in the case and will be meeting with specialist doctors (juris) Fisher, Baxter and Carchman today. We anticipate bad news and are ready to offer our sympathies to the loved ones during this trying time. In this situation the grieving process may be stymied at the stage of denial and that always makes things more difficult. 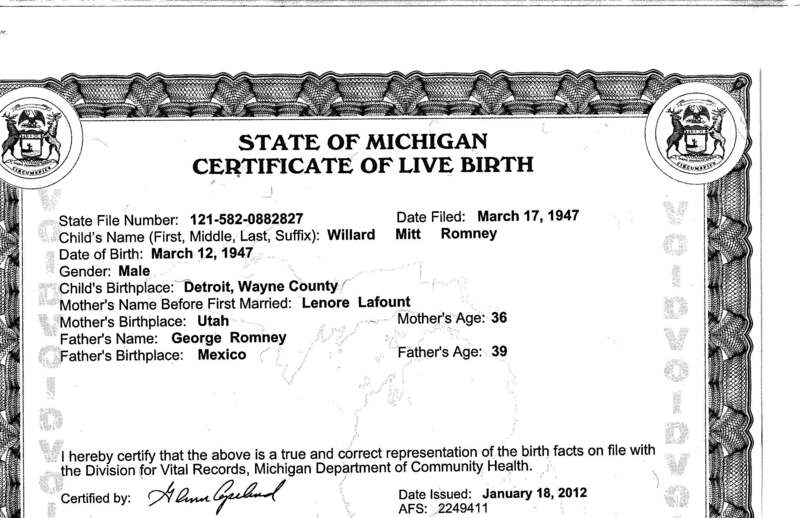 In a move that smells of further pandering to the birthers (since there are no legitimate questions about Romney’s birth facts), Willard Mitt Romney released his birth certificate to the press, according to a Reuters story. I’ve worked on so may vital records projects that I had to stop and think whether this certificate is one of mine or not (it isn’t). There’s not much interesting unless one thinks like birther, and then one has to consider that the Cold Case Posse said that a scanned birth certificate must have 40 or more layers, and this one doesn’t. There’s no name of the hospital (it’s known) and there’s no doctor’s name or signature. The certificate is obviously trimmed and there is no visible raised seal. So by birther standards, this is just an image on the Internet, and not a very satisfactory one. A new campaign video from the Obama Campaign contrasts John McCain and Mitt Romney. McCain, it says, had the courage to stand up to the extremists in his party; Romney does not.